Gather your parts. 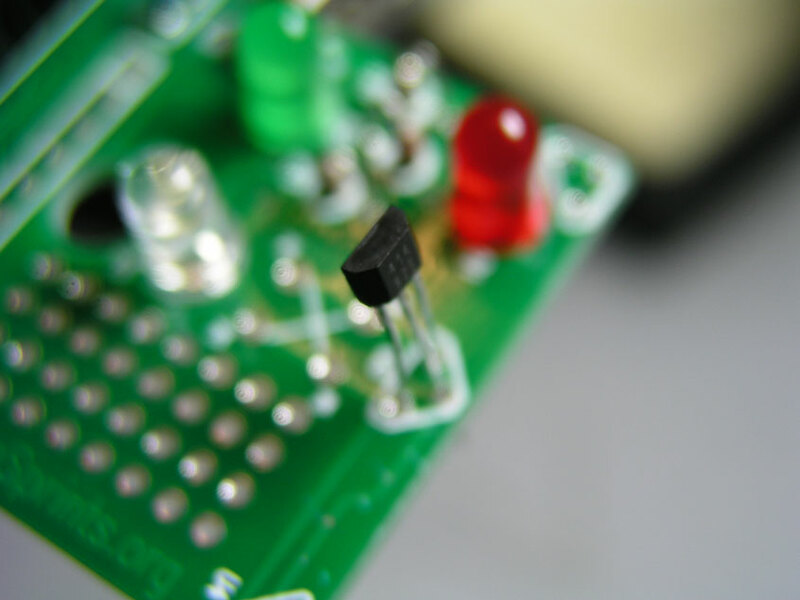 A list of all the required components can be found in the Electronics parts list page. 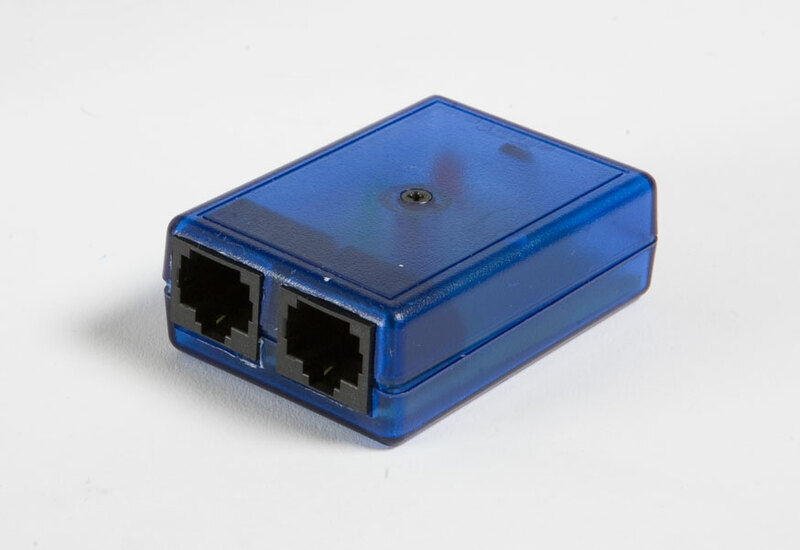 Attach RJ45 Jacks. 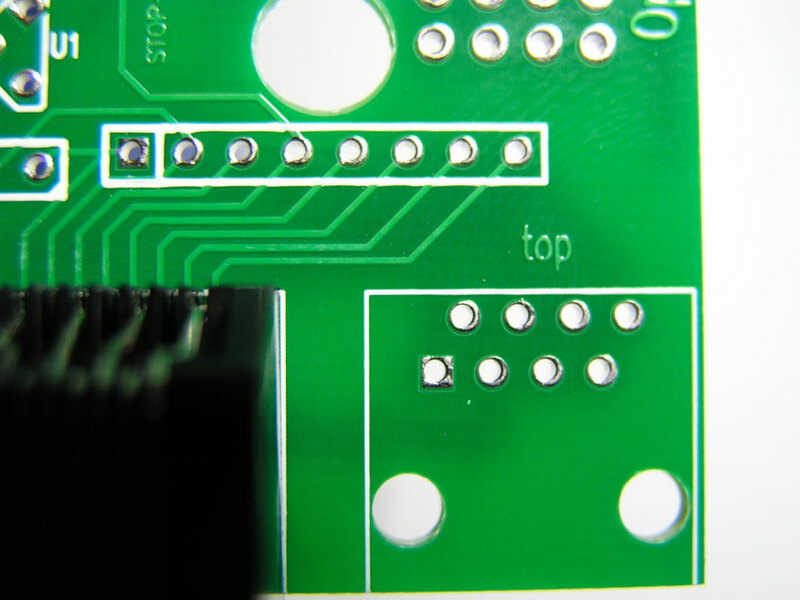 Attach RJ45 jacks to the side that says "top". 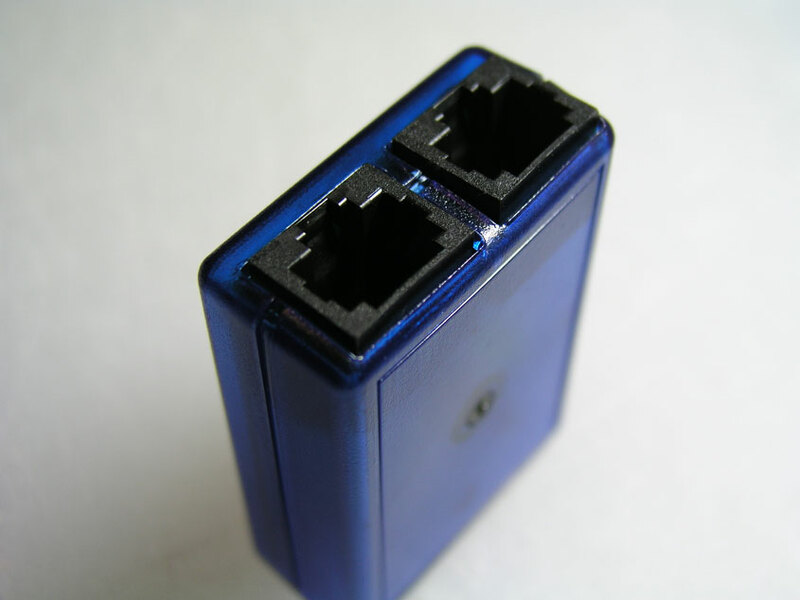 Solder RJ45 Jacks. Solder the RJ45 jacks on the side that says "bottom". 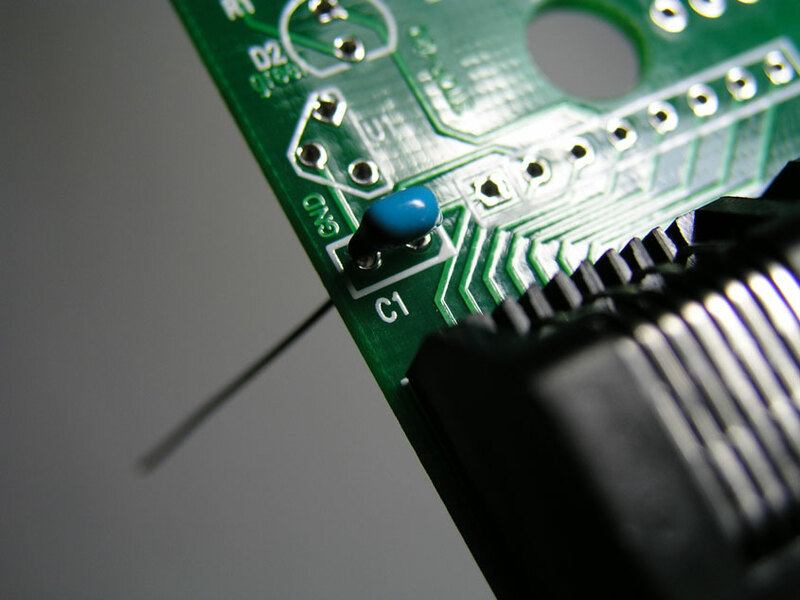 Install and solder the capacitor in C1. 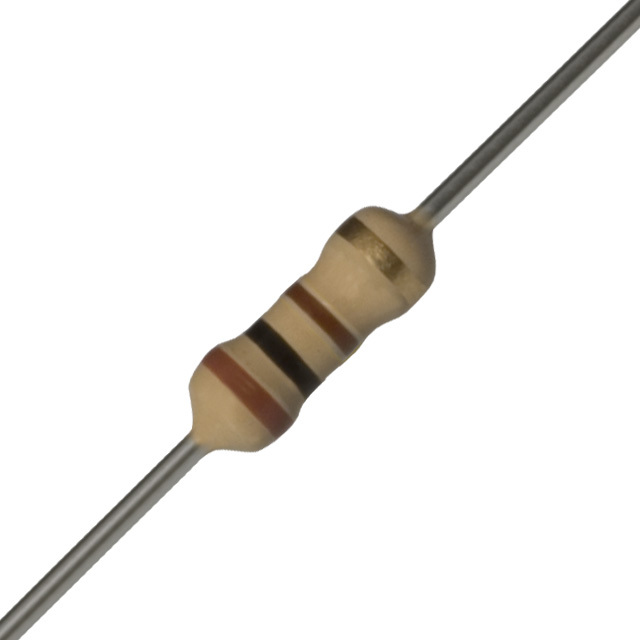 Colors of a 100 ohm Resistor, brown on one end, gold on the other. Colors of a 220 ohm Resistor, red on one end, gold on the other. 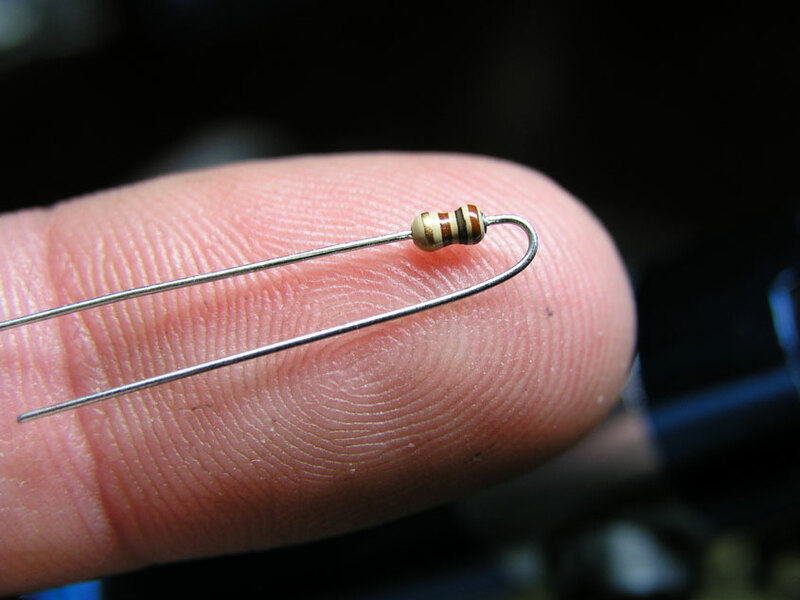 Bend the resistors like this. If you want the colors facing up, don't bend the side with the gold stripe. FYI, this resistor is 100 ohms. 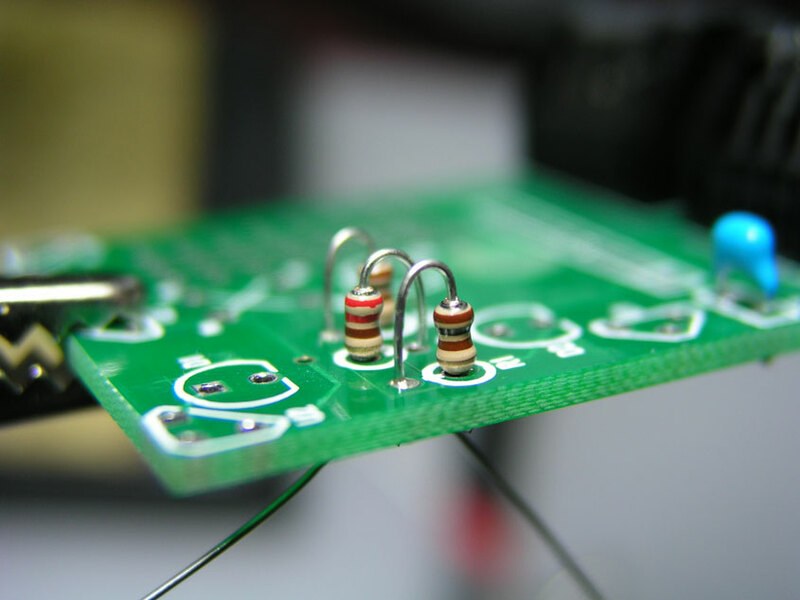 Install the 100 ohm resistors first into R1 and R3. Then install the 220 ohm resistor into R2. Here is a picture from the side, notice the colors on the resistors, does yours match? Install the LEDs. Here are the installed LEDs. Red in D1, Green in D2, and White in D3. NOTE: Make sure the flat spot on the LEDs matches the flat spot on the drawing. Install the Hall Effect Sensor. 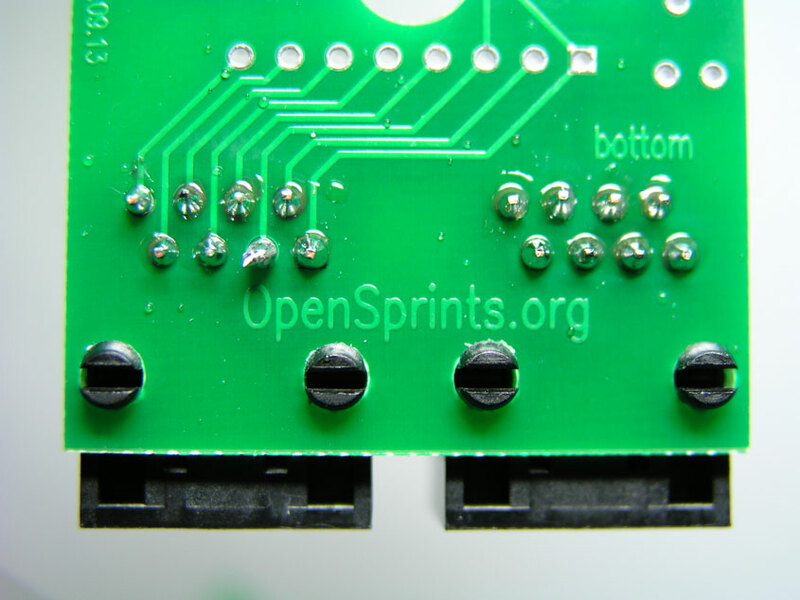 NOTE: The pictures below work perfectly for the Kreitler Goldsprints Rollers, but you may want to consider placing the Hall Effect Sensor in 1 of 4 possible different positions on the PCB that might work better your particular sensor and magnet locations on the rollers. The closer the hall effect is to the magnet rotations -- the better. 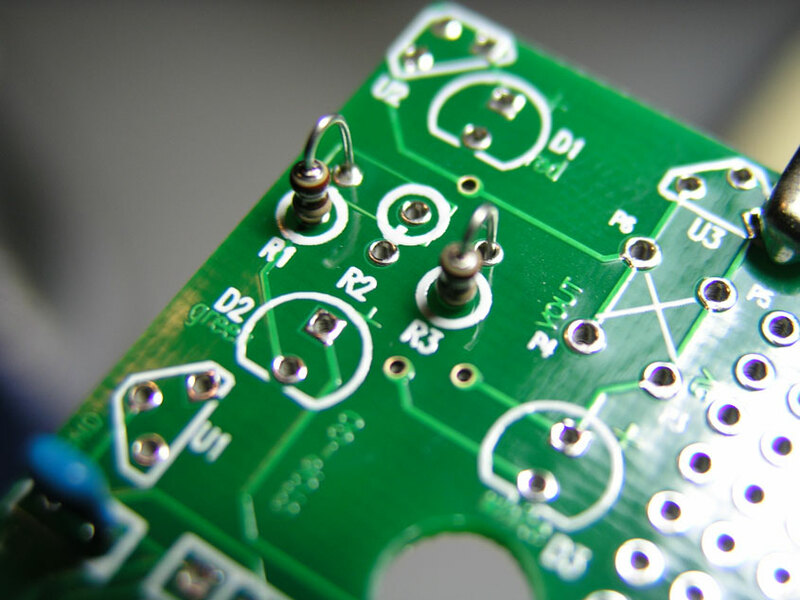 Hall effect Sensor Bevel faces OUT! 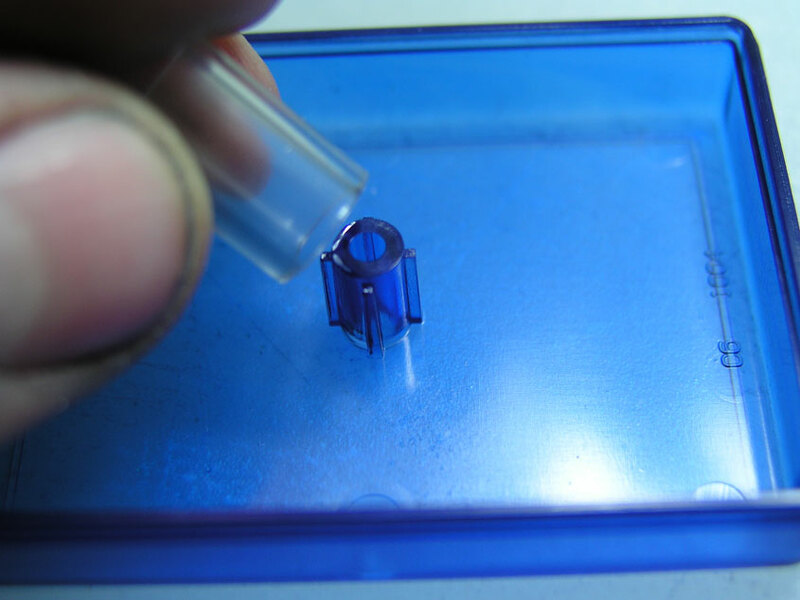 Place hall effect sensor like so. Solder the hall effect sensor in place. 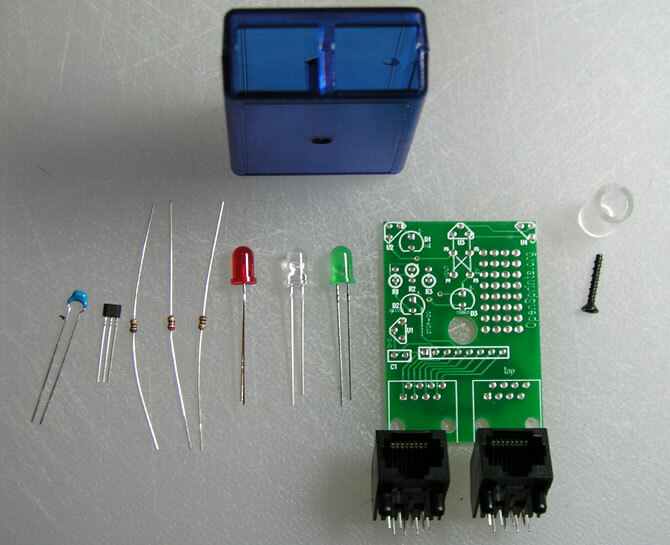 Assemble sensor enclosure. 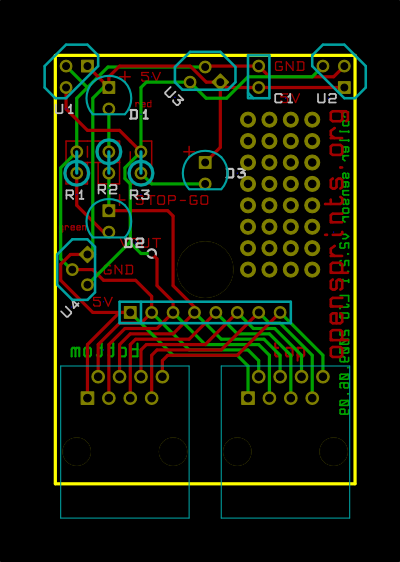 Set PCB in the sensor case bottom. 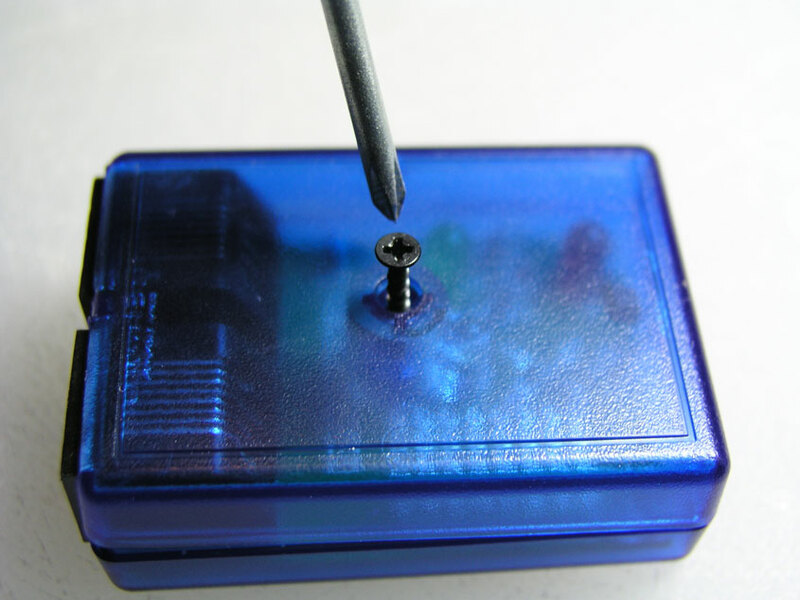 Bend the hall effect sensor carefully so that it will fit in the case. 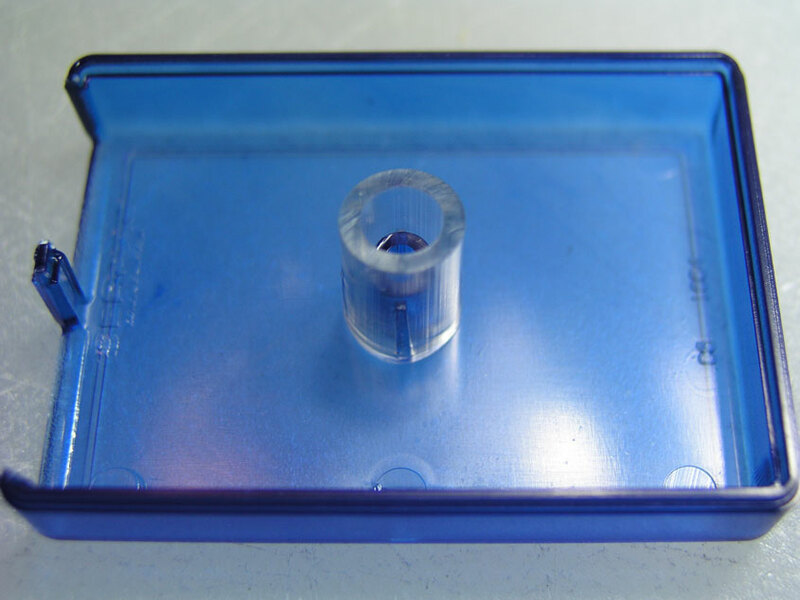 Insert the spacer into the top of the case. Screw top and bottom of sensor case together. Repeat 3 more times and then you are done. 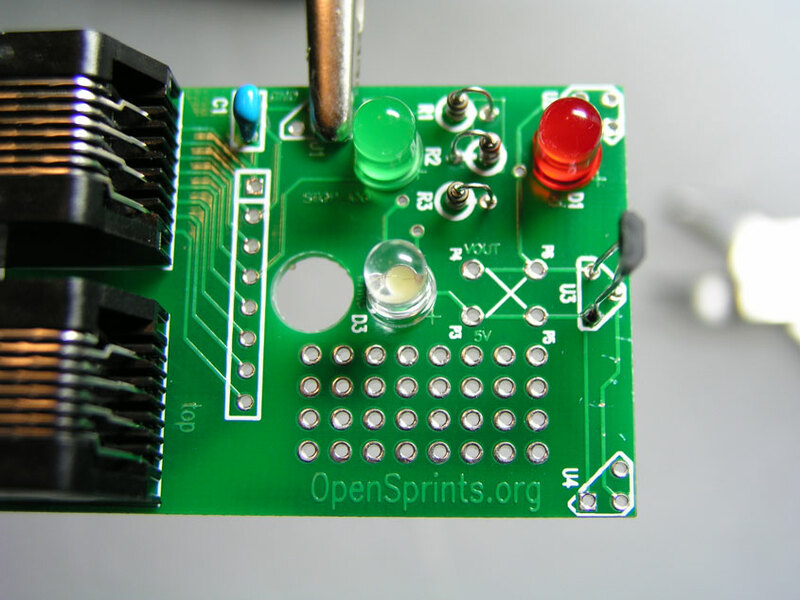 There is an easy way to assemble the sensor PCB similarly to previous versions, before start-stop indication was added. 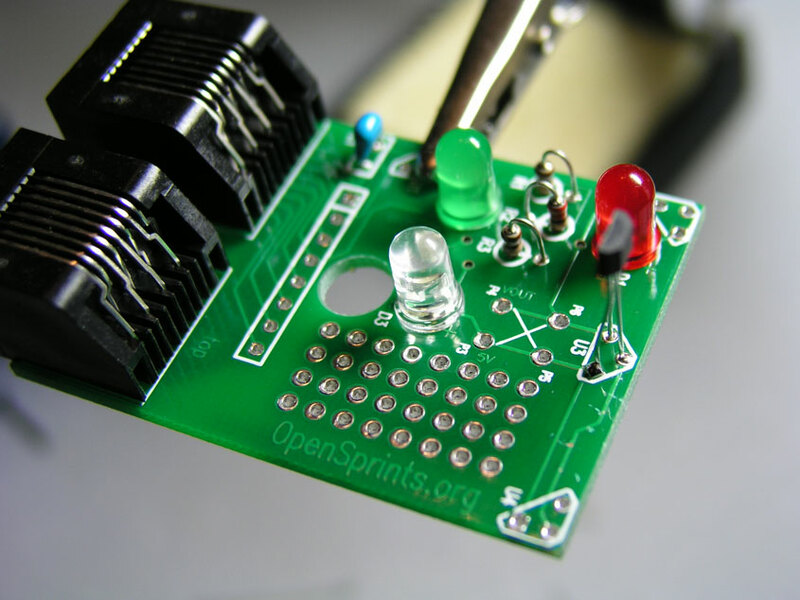 The green LED can be omitted, and the resistor for the red LED can be installed in a different way. 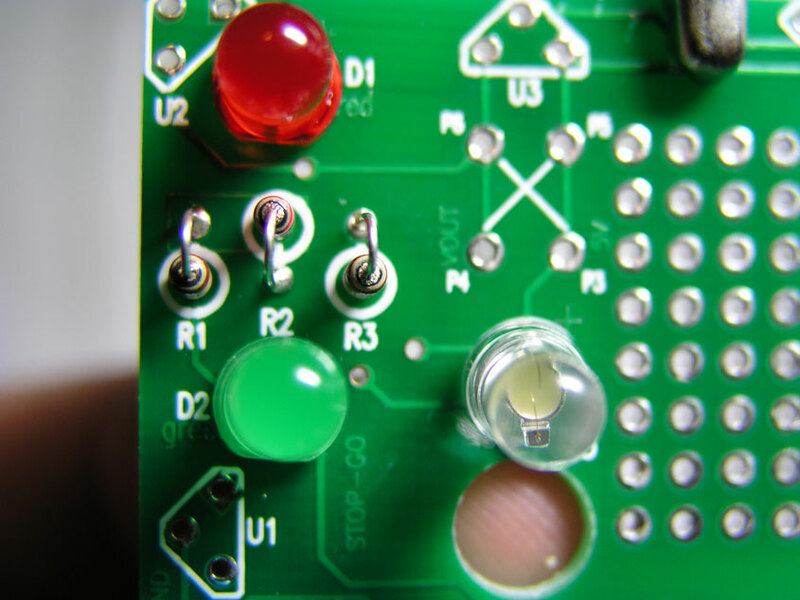 The result would be that the red LED becomes an "On" or power indicator that stays illuminated as long as the sensor module is connected to the interface module. 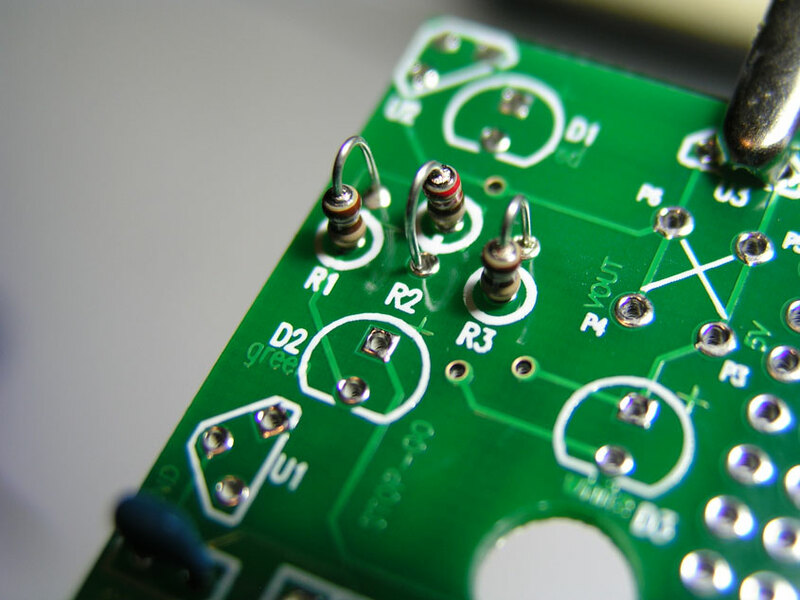 The following image illustrates how to stuff the 220 or 330 Ohm resistor and bypass the start-stop functionality. The red LED just acts as an "On" indicator here. This version of the sensor board also acts as an start-stop indicator so that the rider knows when to go and when to stop. If the sensor module is not being used to count roller revolutions, it can be mounted on the handlebars. Run an ethernet cable from the handlebars to the sensor on that bike. In other words, if you build 4 of these, you can mount 2 of them to count roller ticks, then mount another on the handlebars and daisy chain them with ethernet cables (i.e. from the main board to the roller tick counter to the handlebar 'indicator'). The Start-Stop indication is similar to this animation, except with only one red STOP light and one green GO light. There are three LEDs now, instead of two. The red and green LEDs indicate to each rider whether it's time to go or stop. 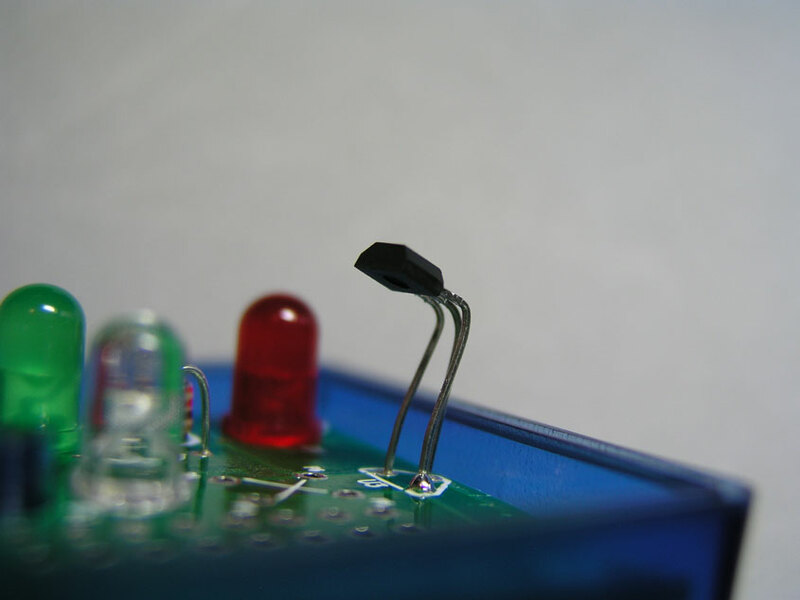 The white LED illuminates whenever the magnetic field is in the range of the sensor. Red or green must always be illuminated, but not both at the same time. Together, the start-stop lights also indicate that the board is getting power. 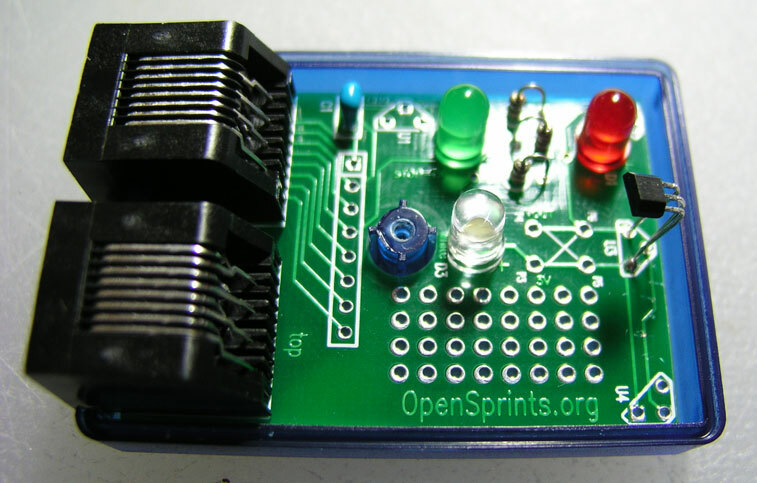 If the board is connected to an Arduino that is not programmed with the OpenSprints firmware, both red and green LEDs may light at the same time. 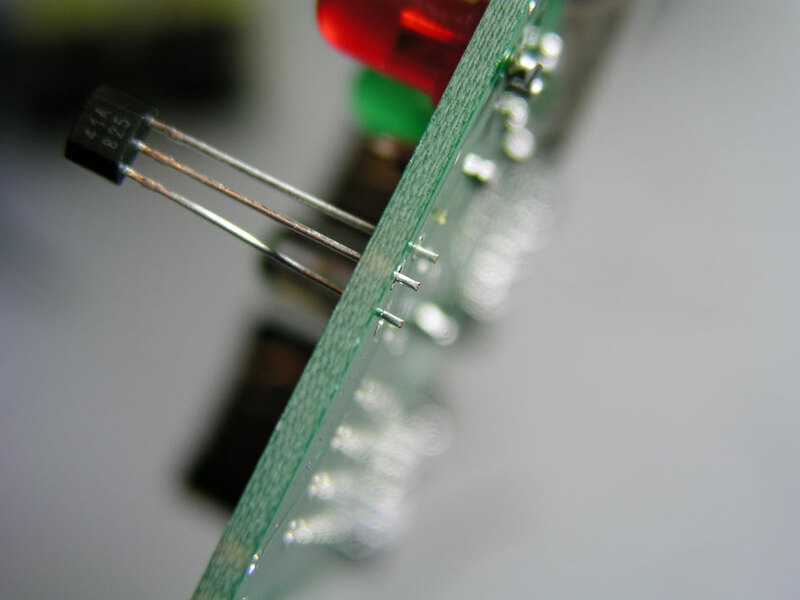 For the green and white LEDs, 100 Ohm resistors are recommended (R1 and R3). 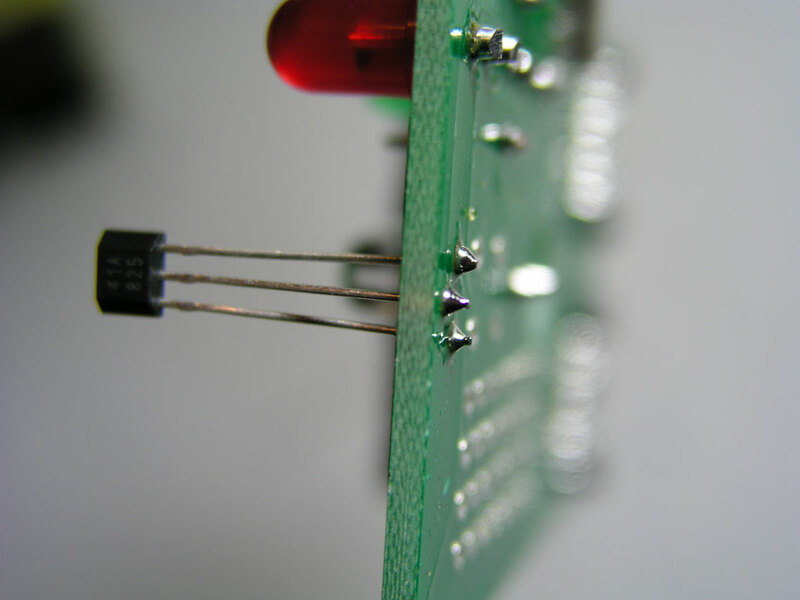 For the red LED, a 220 Ohm or 330 Ohm resistor is recommended (R2).